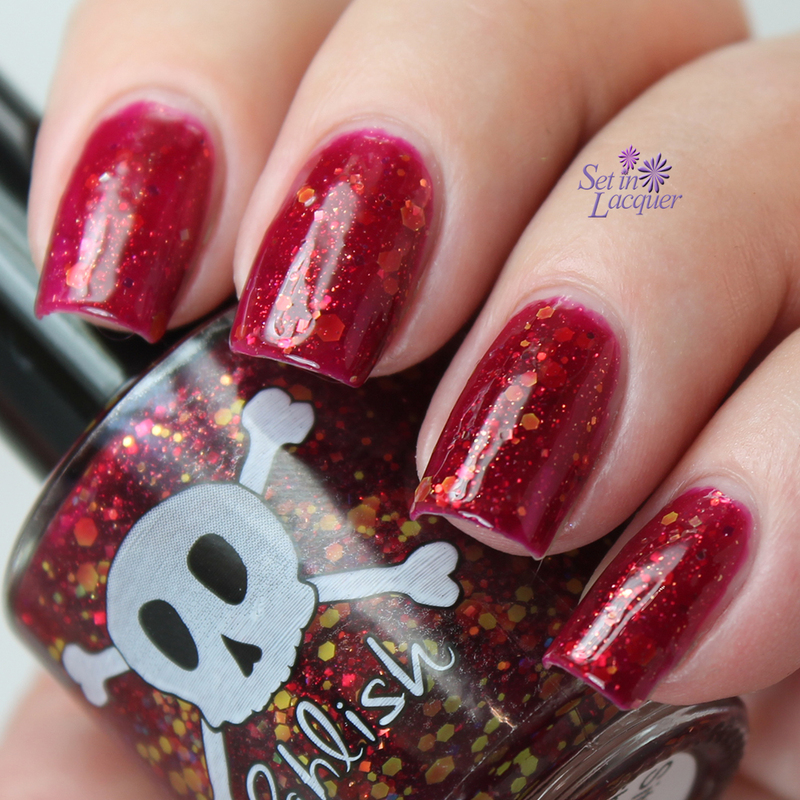 Pahlish is launching their Buccaneers and Buried Gold Collection Sunday, April 5, 2015. This gorgeous limited-edition, five-polish collection is sure to have something for everyone to treasure. This collection is inspired by the adventure novel Treasure Island by Scottish author Robert Louis Stevenson. I had no issues with application. I will get into how many coats and details below. Set sail with me and let's go look at the treasures! Oh and check out that pirate packaging! Sitting in the Apple Barrel is an intense raspberry jelly with a mix of iridescent orange glitters and matte neon yellow glitters. The jelly finish on this provides so much depth - it's amazing. To be honest, I am not a real glitter fan and this polish has me wondering why. This is three coats with a top coat. I could have gotten away with two coats, but the lighting and camera are pretty harsh when it comes to jelly polishes. 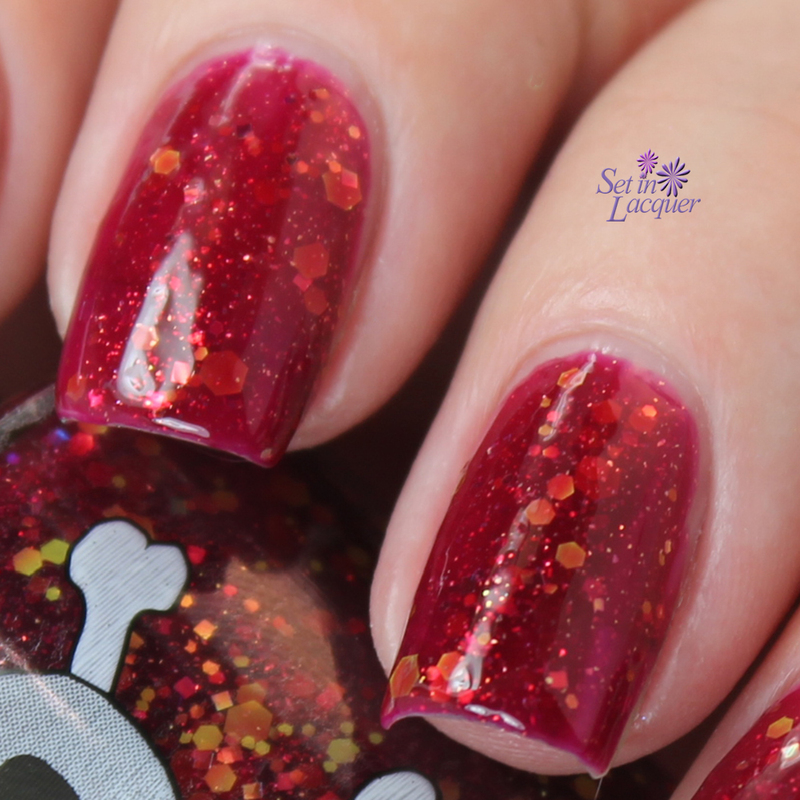 Billy Bones is a neutral tan with a mix of soft violet-blue shimmer and ultrachrome flakes. 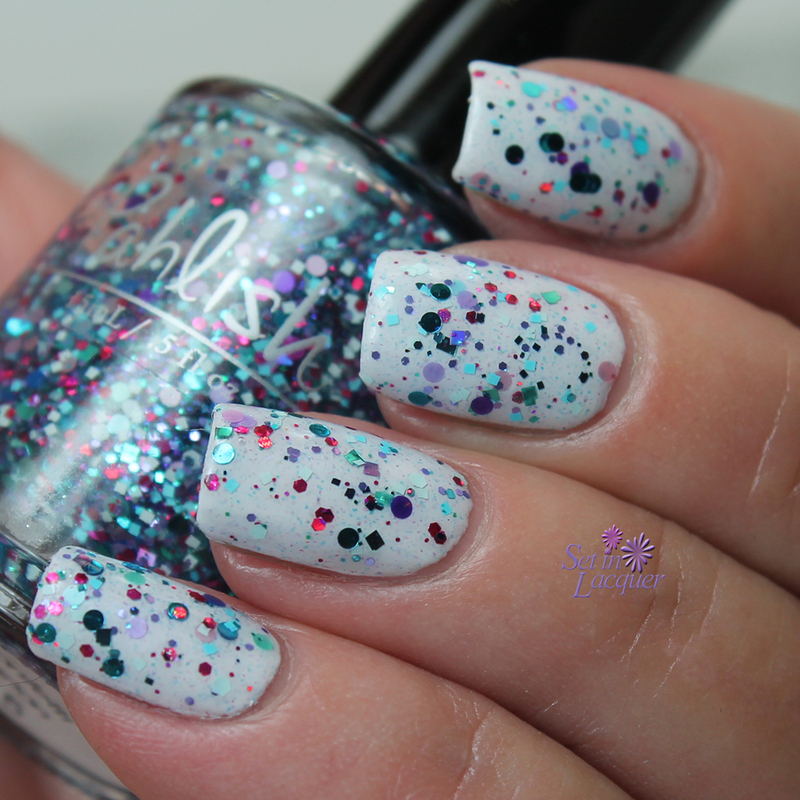 The added shimmer and flakes simply make this polish extra special. It kind of reminds me of the old paper the pirates used for their hidden treasure maps. Not that I have seen one of course, but this is what I think it would look like. I had no issues with application and this is two coats with a top coat. Tropical Island Treasure is a bright aqua cream with tiny bronze flakes. The flakes don't seem very obvious in the bottle. But they definitely set the tone on the nail. This may be my favorite of the collection. This is two coats with a top coat. 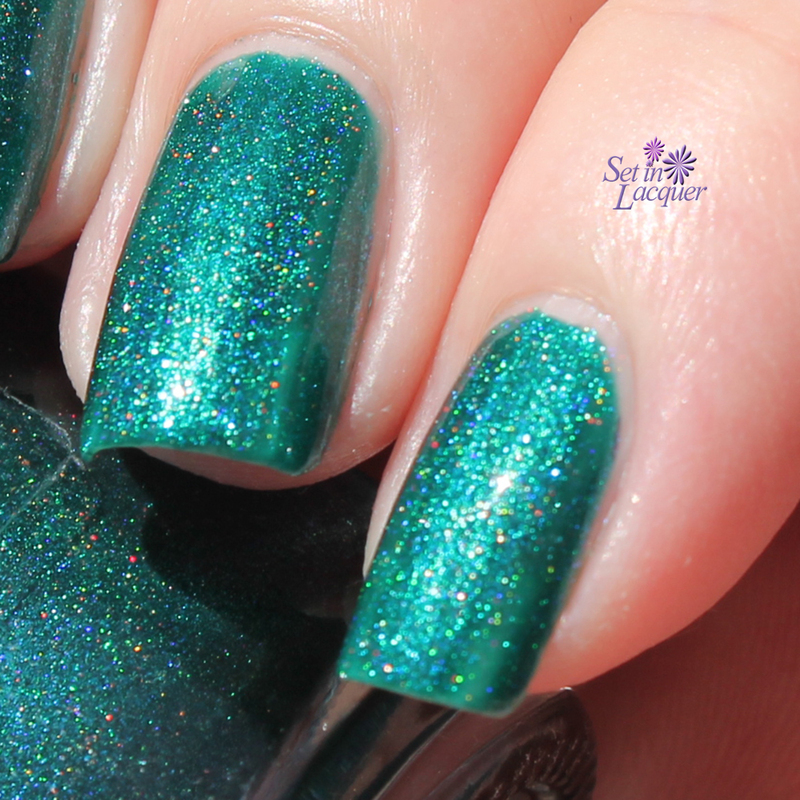 Sailing the Hispaniola is a rich ocean blue with a soft and subtle linear holographic finish. This vivid blue is stunning. The holographic shimmer is subtle in indoor lighting, but the shimmer is kicked up a couple of notches in the sunshine. The swatches below are in indoor, artificial lighting. This is two coats with a top coat. And in the sunlight - although I need to emphasize that this is late afternoon sunlight, which makes the photos a bit warm. Cape Coast Castle is a deep turquoise jelly with a mix of holographic violet glitters and green sparks. This jelly polish has an amazing dimension and the shimmer and glitter seem to float in the depth of the polish. This is three coats with a top coat. Once again, I could have gotten away with two coats, but decided to go with three. So which treasure will you be hunting for? Pahlish's creations are 5-free and do not contain formaldehyde resin or camphor. Follow Pahlish on Facebook and Instagram @Pahlish to get current information and some sneak peeks of upcoming releases. Today, I have the Pahlish contribution for the March A Box, Indied subscription box to share with you. Quite Ribbiting is an intense turquoise shade with scattered holographic with an amazing heavy teal and blue shimmer. This is my kind of shade. While I have seen some swatches of the other polish contributions and they are gorgeous, I can honestly say, in my opinion, that this is the polish that would be THE polish to have from this box. It's holographic and a teal turquoise? Yes, please. This is two coats with a top coat. There were no application issues at all. It applied smoothly and evenly and it didn't leave any color behind - as some shades like this may. Let's take a look. I don't have any sun shots of this polish. But I will grab some for you this weekend - just in case you are still on the fence. I am traveling for work this week and won't be able to get the sun shots until then. So these are shown with artificial light. Look at this amazing polish in the sun! This one is shown under a LED light to show the dazzle and shimmer. The theme for April's box is April Fools and in addition to Quite Ribbiting from Pahlish, it will include offerings from Crows Toes, Black Cat, Hare and Serum No. 5. A Box, Indied retails for $50 and will be available at Noon and 7 p.m. MST, March 26, 2015 at Llarowe.com. Follow A Box, Indied and Pahlish on Facebook and Instagram @aboxindied and @llaroweofficial to get current information and some sneak peeks of upcoming releases. 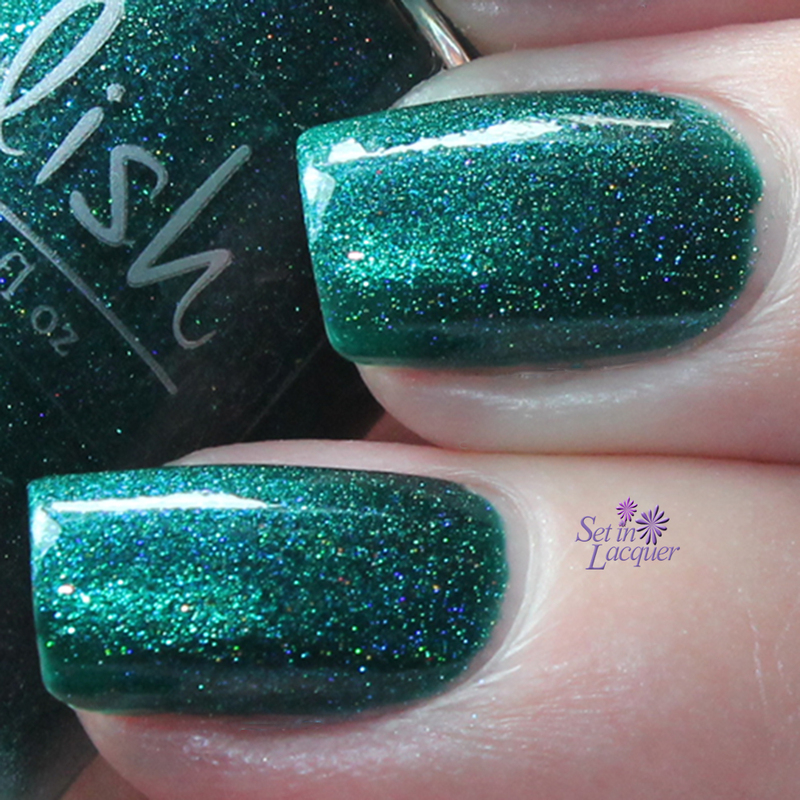 Today's post is a Pahlish duo and I am excited to share it with you. The March duo simply screams of a celebration. Ticker Tape Parade has Tissue Paper Flowers and Confetti Cannon. These polishes are so complementary to each other. These polishes applied wonderfully. There were no application issues and the glitter played nicely. There was no fishing for glitter and it rests flatly against the nail. Let's take a look at the March duo "Ticker Tape Parade." Tissue Paper Flowers is a crisp white creme polish with a mix of turquoise, neon purple, hot pink, and snow white flake shimmers. I simply adore this polish. It is so subtle and classy. It reminds me of fine linen paper - with a bit of attitude. The name suits it perfectly - remember those paper flowers we created in school? Yep, we were so proud of them. The bits of shimmer in this polish add a dimension that is phenomenal. This is two coats with a top coat. I can see this is going to be a often used polish for me. 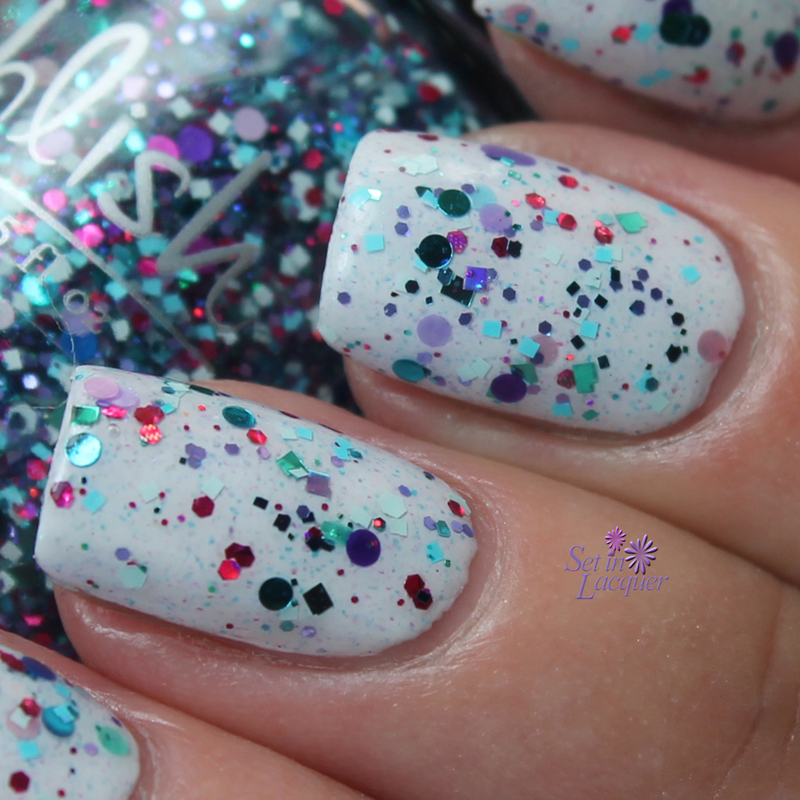 Confetti Cannon is a clear glitter top coat with an eclectic mix of turquoise, lavender, bright pink holographic and matte mint and aquamarine glitters accented by multicolored satin dots and soft neon purple shimmer. It is simply a party in a bottle! Birthdays, anniversaries or simply a celebration of the day are perfect occasions to wear this top coat. It will complement almost any polish. The glitter applies well. This is one coat of Confetti Cannon over Tissue Paper Flowers. This duo will definitely give you a lot of options. If you want subtle, Tissue Paper Flowers is perfect. Want to add a bit of celebratory attitude? Add Confetti Cannon. This duo launched yesterday, March 8, and sold out quickly. It will be available every Sunday in March. For these, and more releases, watch Pahlish's Facebook page for official launch times. This duo, when available, can be purchased for $16. Pahlish is relaunching their Sweethearts Collection tomorrow, Friday, February 20, 2015. This gorgeous limited-edition, five-polish collection is sure to have something to please everyone. This collection is inspired by Sweethearts Conversation Heart candy and the actual phrases imprinted on the candy and are sure to put you in a sweet mood. I had no issues with application. I used three thin coats for each swatch. I also applied a generous coat of top coat for a glassy shine. Let's take a look. These photos were taken in artificial light as the sun has decided to hide when I am home. Be True is a pale gold linear holographic with metallic gold micro-flakes with iridescent pink and violet sparks. This metallic gold is stunning and has a true gold sheen to it. Dear One is a lavender purple linear holographic with gold shimmer and gold micro-flakes. The gold micro-flakes complement the soft purple completely. Let's Kiss is a neon scattered holographic with hot pink, violet-blue and violet-pink micro-flake shimmer. This is my kind of pink. This neon shade will add a vibrant pop of color to your nails. The shimmer and shine add a tremendous depth and dimension. Only You is a soft rose, almost salmon, pink linear holographic with rose-gold and metallic gold micro-flakes. The soft rose gold flakes add an amazing dimension to the polish. Yet, they don't distract from the soft color. You & Me is a silvery taupe linear holographic with gold metallic micro-flakes and taupe/red shimmer. This shade is shadowy and sultry. It is gray. No, it's gold. No, it's taupe. Well... it has many personalities.